WOBURN, MA (July 22, 2015) – Tocci Building Companies (Tocci), a Boston-area construction management company and recognized leader in virtual design and construction solutions, participated in the Seventh Annual “Buddy Run” fundraiser on July 18th, 2015. Sponsored by Tocci, the Buffalo Soldiers Motorcycle Club, and Boston Harley-Davidson, the “Buddy Run” featured motorcyclists participating in a two-hour urban “motorcycle run” to support the important work of the Supporting Parents and Resilient Kids Center (SPARK Center) in Boston’s Mattapan neighborhood. 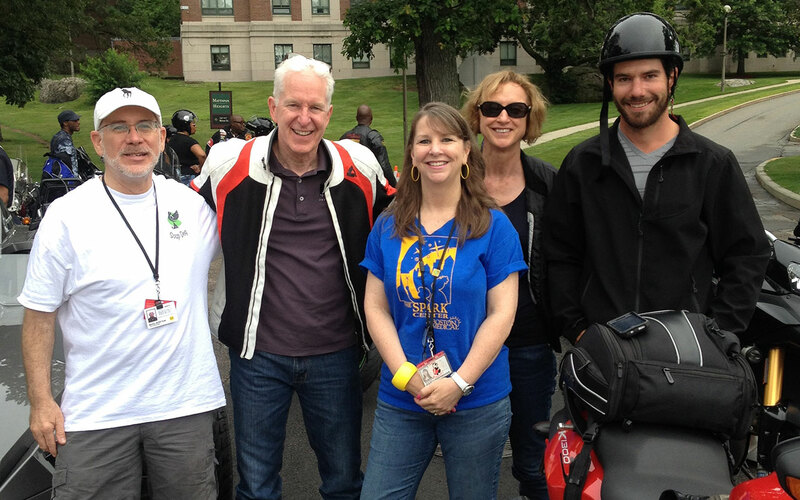 Tocci’s own avid motorcyclists, John Tocci, Chief Enabling Officer, Lila Tocci, Director of Company Life + Charitable Giving, and Sam Mellen, Assistant Superintendent, participated by hitting the open road along with dozens of other riders. For John and Lila this is their second consecutive “Buddy Run”. In addition to Tocci’s motorcyclists, Mark Herstein, Design Manager, assisted with set up, event organization, and raffle ticket sales. The police-escorted ride began and ended at the SPARK Center, located at 255 River Street in Mattapan, MA. Following the ride, a post-event festival was held, offering concessions, raffles, music, and family-friendly activities. The SPARK Center relies on partnerships with Boston Medical Center (BMC), state and federal grant support, and the generosity of private foundations, individual donors and volunteers. The annual “Buddy Run” fundraiser helps to supplement these gifts in order to keep its high-quality medical and psychotherapeutic services free of charge. The SPARK Center provides therapeutic, medically-specialized programs for children of all ages based on the philosophy that all children are resilient and able to take control of their futures. Making long-term investments in Boston’s urban communities, the SPARK Center and its supporters, including Boston Medical Center, are dedicated to helping families make healthy choices, cope with emotional problems, and gain solid educational and parenting skills. For more information and to make a donation, please visit bmc.org/SPARK. Tocci Building Companies, a leading construction and project management firm, specializes in Virtual Design and Construction (VDC), Building Information Modeling (BIM), Highly Collaborative Project Delivery (HCPD℠), and Integrated Project Delivery (IPD). Tocci was an early adopter of VDC in the Northeast and in 2006 committed to use it on all projects. In 2008, Tocci built the first IPD project in the Northeast and is now doing IPD across the country. The SPARK Center, originally known as the Children’s AIDS Program, was founded by the Boston Public Health Commission in 1989 in response to the pediatric AIDS crisis in Boston. It was established in its present community site in 1992, and became part of Boston Medical Center (previously Boston City Hospital) in 1995. In September 2004, through a state mandated merger with another Boston Medical Center program (Family Development Center), they expanded their mission to serve children with other medical conditions, as well as children with traumatic histories due to caregiver disruptions, loss and/or suspected abuse/neglect. As a result of this expanded mission and an increase in children served, they have adopted a more inclusive name: The SPARK Center – Supporting Parents and Resilient Kids. Built in 1992, their sunny, cheerful SPARK Center houses state-of-the-art infant care rooms, multiple toddler and preschool classrooms, private therapy and testing rooms, a nurse’s office, a full kitchen, child-friendly spaces for specialists and administrative offices. Outside playground equipment is safe, colorful and age-appropriate, and the facility sits on a beautiful open lawn with ample play area and a lovely garden. The Buffalo Soldiers Motorcycle Club was established in 1993 in Chicago, Illinois. With a mission of fostering unity and fellowship amongst motorcyclists, the club has grown from one, original chapter to over 100 chapters nationwide and overseas. With professional men and women dedicated to the sport of motorcycle riding and safety, the Buffalo Soldiers Motorcycle Club organizes numerous community service events, including feeding the homeless, awarding scholarships and, of course, the Annual “Buddy Run”.